Raising this question got me thinking and this lead me to consider the idea of a self-published book, using Blurb for example. This would be a cost effective possibility but had one major flaw from my point of view. The print quality could never match the images which will be on display. I am using Fotospeed Platinum Etching for the exhibition. This is a fine art matt photographic paper which has a ‘white tone’ and slight texture which I believe enhances the appearance of the photograph. Its thickness (285gsm) also makes it a pleasing paper to handle. A true photographic print and not a printed page in a book. They are quite different things. I had considered some form of photo album in the past but I wanted something rather special, something bespoke. This body of work means a lot to me, as the images are of an area I have lived and breathed for the past 25 years. I researched various options, suppliers etc and finally settled on using a company called Hartnack and Company based in Devon. Although you can order online I decided that given the investment it would be worth my while making a visit to their premises and discuss in person exactly what I had in mind. I would also be able see for myself the vast range of fabric swatches and portfolio designs they offer. The company is owned by husband and wife team, Nick and Jackie Hartnack, and they could not have been more helpful. I took examples of my work and after much discussion finally decided to order a 12″ x 12″ hidden screw post portfolio with matching slip case. 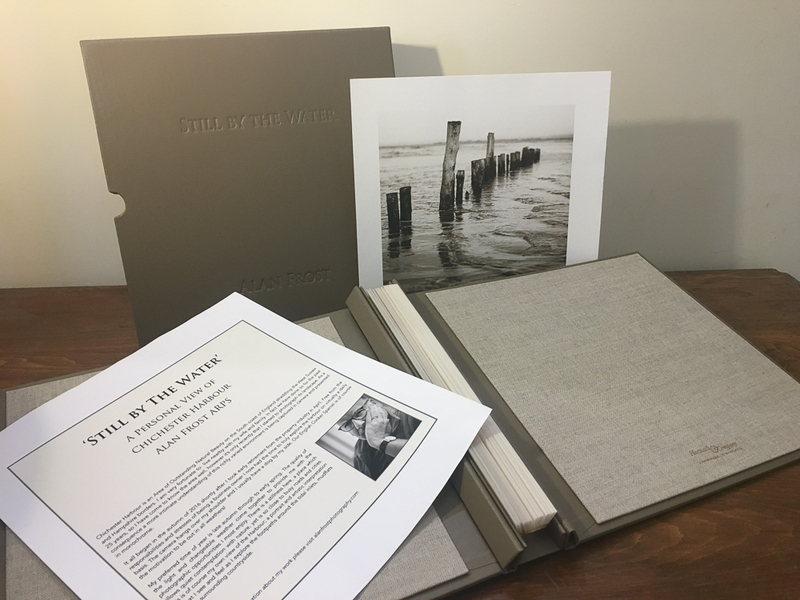 They also provide a personalisation service so both the portfolio and the slip case are blind debossed with the project title: ‘Still by the Water’ and my own name. Securely packaged it was delivered last week and I am delighted with the outcome. This is without question is a quality item. 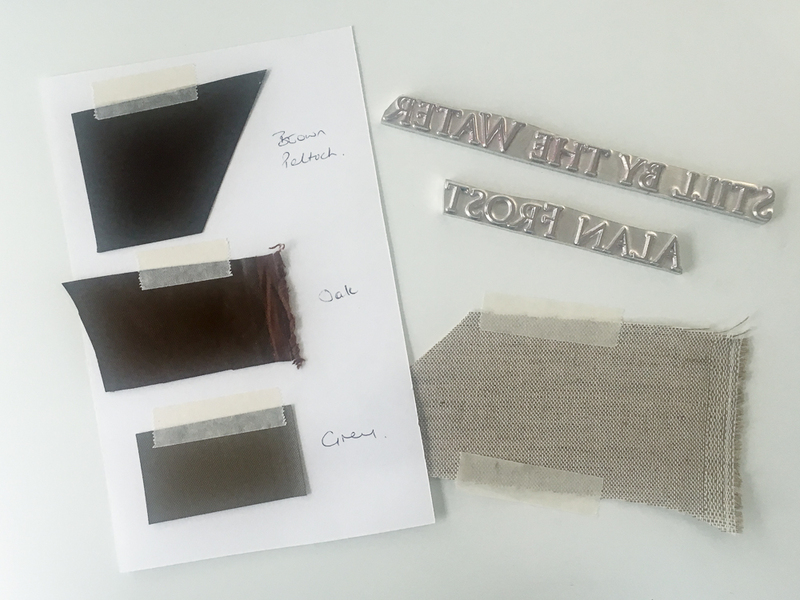 Beautifully put together by hand and made to last using archival materials. Not cheap but I have always believed that in life you get what you pay for. I now have the task of printing the introduction page, all the photos including those in the exhibition itself, cutting archival interleaves and attaching the hinge strips, all in time for the exhibition in four weeks time. Finally I would say this portfolio is not about the exhibition. Yes, the exhibition has been the catalyst to get on and do it, but essentially this is about creating a lasting body of work which family and friends can look at in the future. Hopefully a fitting conclusion to a project which has taken up so much of my time in the past 18 months. A truly unique item which I shall be proud to share with others. Lastly my thanks once again to Nick and Jackie Hartnack for a first class service. product and buying experience. Looks like a fitting addition to the exhibition – Am looking forward to seeing the exhibition, together with the portfolio ! Alan, I have enjoyed greatly a foretaste of what will be in the exhibition through your Instagram feed and here on WordPress, and I will be hot-footing it down to Chichester next month. I have toyed with the idea of a photobook from Blurb, or something similar – it undoubtedly takes the hard work out of a complex process but you are surrendering your work to a third party and I am not fully convinced of the quality (although some books I have seen look impressive). This portfolio sounds like something really special, and fitting, for a body of work that has been your driving force for quite some time. I’m going to bookmark the company. My wife regularly complains that I have a hard drive full of images, 95% of which never seen the light of day, perhaps this is the way to go with the cream of the crop. A valuable post, Alan. I will certainly contact you nearer the exhibition, Alan – it would be good to meet up.